A couple with a young family who didn’t want to negotiate public transport with their toddlers and wanted some child-focused tours. We arranged private transport and hired private guides who devised kid-friendly visits to the top attractions. Honeymooners who wanted to be pampered so we arranged private transport throughout and programmed a gastronomy-themed itinerary with private tours and romantic meals at the best wineries. A retired university professor who wanted to improve his Spanish in situ, so we planned daytrips from Madrid with a chatty driver with whom he could practise his Spanish. A family group whose father had mobility issues, so we arranged private transfers from the airport and throughout the trip as well as hiring private guides who took his mobility fully into account when visiting Spain’s top museums and monuments. A recently widowed traveller who wanted to revisit Spain but didn’t want to travel alone, so we booked her private drivers and private city tours so she had the interaction she needed while taking on an emotionally challenging trip. 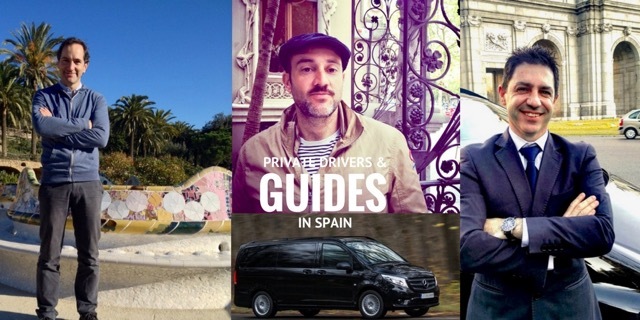 2 Why should you consider hiring a local private driver in Spain? We’ve designed hundreds of itineraries for clients who prefer not to drive but still want to get to off the beaten track. Many of our clients may even have driven themselves on previous visits to Spain but have decided that for this trip, they want somebody else behind the wheel. And it’s more than just the driving – it’s often about the insider knowledge they glean and time they can save. 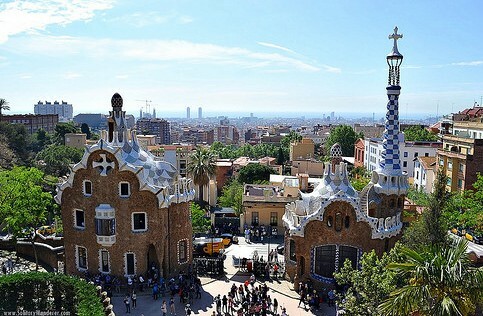 Take for example a day trip from Barcelona to Monserrat. A private driver and guide will not only take you to the monastery which is an hour’s drive from Barcelona but can combine this with stopping off at a local winery afterwards and, having lunch at a traditional restaurant in the countryside away from crowds. Of course, you can drive yourself but having a driver frees up so much time for you and enhances your trip! You don’t have to worry about the route, the wine or cava tastings, parking the car or getting back to Barcelona safely. Hiring a driver isn’t just about the actual driving – it’s really about the flexibility and insider knowledge they provide as well the maximising your experience in a short timeframe. 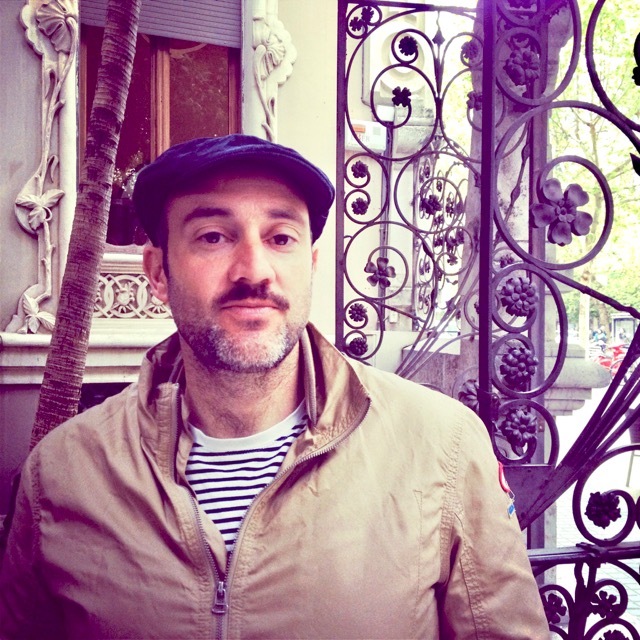 Why not have Luis meet you at the airport and drive you to your hotel in downtown Madrid? He can collect you again in a day or two for a daytrip to Toledo, Segovia or Avila. 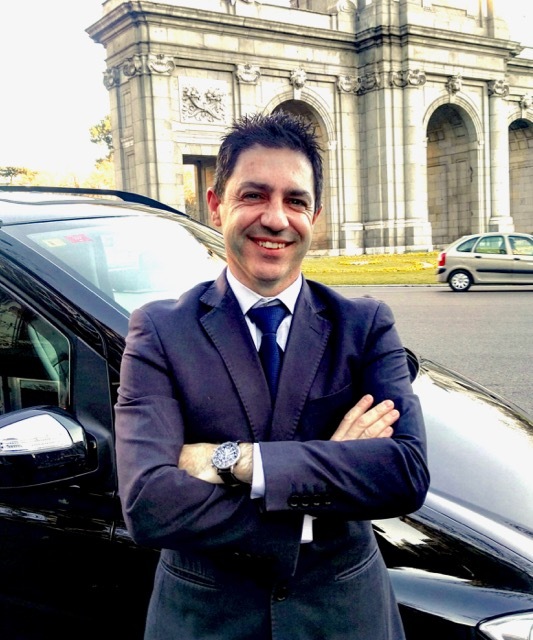 He knows Madrid and its environs like the back of his hand and will get you safely and smoothly to wherever you need to be. 3 Why hire a private driver for an airport transfer? The most popular route for our drivers is the airport transfer. After a lengthy flight (especially if you have a lot of luggage) you’ll find a dedicated local driver waiting just for you in Arrivals to take your bags and show you to your private car which is parked right outside. If you are going to your hotel, s/he’ll will take the most direct route and park right up outside reception and assist with your baggage. If you’re taking a connecting high-speed train, the driver will get you and your bags right to the train station. 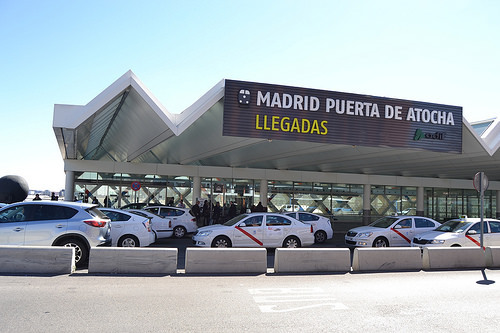 Remember that if you are a family group of 4 people or more, with luggage, you will find it hard to fit in a standard Spanish taxi and will need to split up into two taxis, which is a lot more hassle and much more expensive than one pre-booked fixed-price transfer. When booking your transfer with us, do let us know if you are travelling with more than one suitcase and one piece of hand luggage per person – that way we can ensure we reserve the right-sized vehicle. 4 Why hire a private driver for day trips? We also love booking drivers for clients visiting Spain’s best wineries. A private driver who can get you safely to and from the wineries which are often in rural locations that are tricky to find – never mind the added bonus of being able to enjoy the wine tastings much more. We arrange lots of day trips from Madrid to the Ribera del Duero wine region and from Bilbao to La Rioja and the Rioja Alavesa wine regions. On these half-day or daylong trips, our clients often ask about what size tip to give their drivers. We always reply that tipping is always optional in Spain but that you won’t offend anybody by tipping especially when they have gone out of their way to make your day extra special. You can read all about gratuities in Spain here. 5 How do we select which drivers we work with? All our drivers have vehicles that are generally luxurious, top of the range, well-maintained and spotless. Think Mercedes, Audi and similar brands. The private drivers we work with always dressed very smartly. While our drivers are not always fluent in English, they are very comfortable dealing with international clients and speak sufficient English to get you where you need to be. We can’t promise they will be able to maintain an in-depth conversation (unless specifically requested) or provide detailed commentary en-route but you will have a very pleasant and comfortable experience through English. That’s something you just can’t guarantee with a standard taxi service. We are sometimes asked whether we can book a ‘student’ driver. Indian and Asian clients say that is commonplace there and we have even seen it advertised in the Netherlands – but it’s not something you’ll come across in Spain or Portugal and we would never book a service that wasn’t 100% reputable. All our drivers hold all the required licenses and insurance. We are also asked about ‘shared transfers’ which would involve pairing up two sets of clients that were travelling to the same destination. Again, we don’t do this. For us, private means private. Although some clients request the same private driver to drive them throughout their entire visit, we believe it makes more sense to hire local drivers at each location. Let’s explain why. Spain is a big country. Imagine a client stays in Madrid for 3 days and then travels onto Seville for a further 3 days. 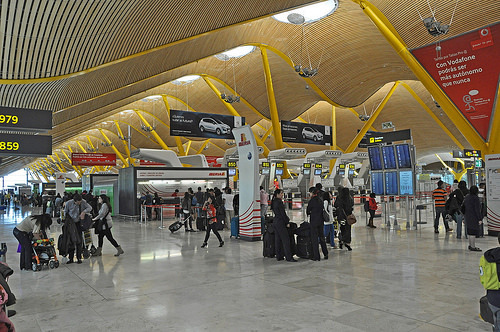 We would book the same private Madrid driver for their time in Madrid including the transfer from the hotel to Madrid’s high-speed train station. 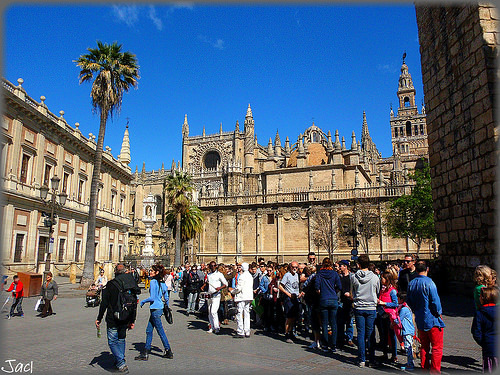 Once in Seville, the client will be met off the train by our local Seville driver who will provide their services in Seville. Similarly in Granada, Cordoba, Malaga or wherever the client is going on to next. Pro-tip: We do this because it keeps costs down – clients don’t have to cover drivers’ overnight expenses. And it’s much better to have local drivers working their own patch as they know it infinitely better. Local drivers know their own city inside-out and they often have permits giving them special access to the historic parts of their own city. 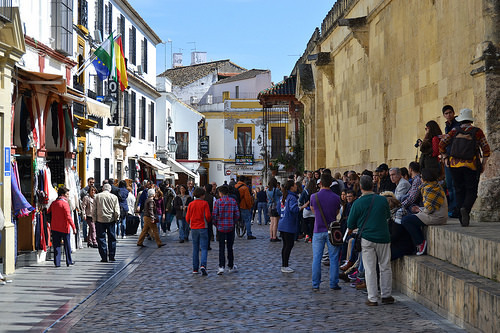 Take the Albayzin neighbourhood in Granada – only locally accredited drivers can access that area. Our network of drivers will get you where you need to go (without even having to ask you) in comfort. No queues. No hassle. Travel as it should be! 8 When do we hire long-distance drivers for our clients? Sometimes, our local drivers will take on longer day or overnight transfers especially for routes that are complicated on public transport such as San Sebastian to La Rioja or when you want to sightsee along the way – for example, travelling from Seville to Granada via Ronda, or from Seville to Lisbon via Evora, or Madrid to La Rioja. For clients who insist on having just one driver throughout their trip to Spain or Portugal, we have some private drivers with a higher level of English and a broad knowledge of Spain/Portugal who offer this service. However, they book up quickly and must be reserved from well in advance. Bear in mind that the price will include their daily fee plus driver’s accommodation, all meals, vehicle expenses, parking and road tolls. You’ll find our long-distance drivers will be able to provide significant commentary on many places you are visiting. And this will be complimented with private city tours. Why can’t your driver do this? In many Spanish cities, only locally trained & licensed tour guides are authorised to give monument visits and city tours. Unless our long-distance driver has multiple city licenses, s/he usually cannot guide outside of their home city. They can quickly respond to a request for an unscheduled stop. Not only do they point out landmarks but they make valuable suggestions for places to visit in the clients own time at leisure. Because it is a private tour, clients can dictate the focus and the pace. Clients can ask all the questions they want to and even stop for an impromptu drink & tapa if they like. If it’s too hot or wet (hardly ever happens!) for an extensive walking tour or the group fancies seeing something on the spur of the moment, our local guides can easily obtain tickets on the spot for almost all attractions without having to wait in line. 11 How do we schedule our clients’ private tours? 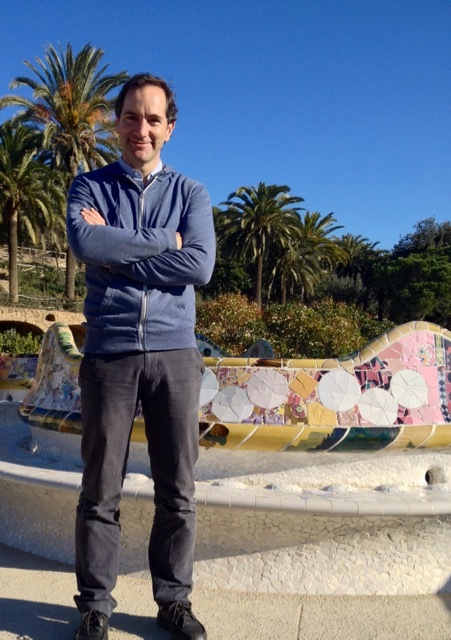 We try to schedule a private city tour on the first morning or first afternoon a client arrives in Spain. This way, they get a great introduction to the city and country. The private guide will generally be with them for 3-4 hours, taking them around the main sights in the old town with a visit ‘inside’ one key sight. When requested, we can extend the walking tour to take in two major monuments but we find our clients make best use of the guides in a more informal unstructured way – exploring the best squares, parks and markets and getting a sense of the layout of the city. We recommend this approach for all the major cities in Spain – e.g. visiting just the Alcazar or cathedral as part of the half-day city walking tour in Seville, visiting the Mosque while on a walking city tour of Cordoba, visiting the Royal Palace as the main sight in Madrid, and just going inside the Sagrada Familia with your city guide in Barcelona. 12 How do we select which private guides to work with? What skills do the bring? 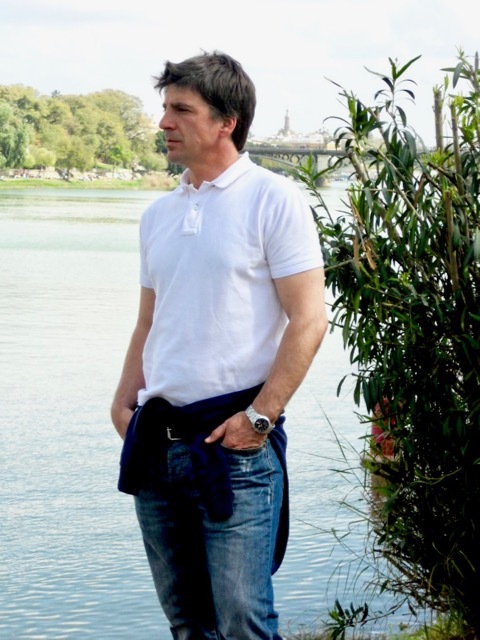 Each guide has to bring an area of specialisation – whether that’s art, history, gastronomy or architecture. Our guides are professionals – they have great pride in what they do and take their job very seriously. Unless you expressly request that shopping be included in your walking tour, our guides will never ever include shopping time in any tour. 13 What types of tours do clients take after a city tour? After the private city tour, the client will have lots of suggestions for attractions to visit by themselves. On subsequent days, they may choose to take another private tour or join a group tour – for example a private gastronomy tour or join a group gastronomy tour. 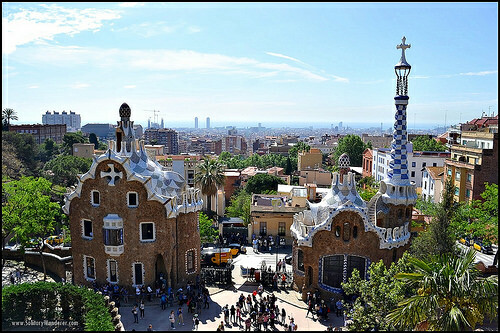 We can also schedule in-depth specialised tours such as Gaudi’s Barcelona we wrote about above or Dali’s Catalonia. Get in touch if you have an idea for a themed-tour. Chances are that we’ve already programmed something similar and have the perfect private guide for you. Our private guide, David, in Cordoba knows all about the Mezquita, the Roman bridge and the best courtyards, plus he’ll give you his tips on where to enjoy the best salmorejo and tapas too! 14 Which scheduled tours in Spain do we recommend? Sometimes clients ask us to recommend scheduled group city tours. We do work with a number of companies that do cater to small groups (about 15 people or less) and deliver tours in English only. We know from personal experience, when travelling ourselves, how infuriating a sprawling or badly operated group tour is – and will only book our clients with reliable providers. When you are comparing the rates for a private guide and a group city tour, please bear in mind that group tours often last just 90 mins and are very general as the guide is aiming to please everybody in the group. Private guided tours are usually at least 3 hours long and you have the benefit of being able to ask the guide to tailor the tour to your interests and needs. Remember, private tour guides charge per session so if you are travelling with a small group or family, it is very cost effective as the price of the private guide gets cheaper with each extra person. One of the worst places to join a scheduled group tour, in our experience, is at the Alhambra. Groups can be up to 30 people, multilingual and your guide will be using a headset and you will be plugged into an earphone. On many of these tours, we’ve found that the reception for the headsets isn’t always sharp, the tour feels somewhat rushed and questions are not encouraged. If your budget doesn’t allow for a private tour, we often recommend hiring a personal audio guide and going it alone. That way, you’ll get some of the historical context but can explore the quieter sections of the monument which are so special! You can read more about visiting the Alhambra (and tours and tickets) here. 15 When does a client/group require the skills of a tour manager or tour director? Need a bit more assistance than a guide and driver can offer? Totally Spain has a fine team of tour managers and tour directors with a deep knowledge of Spain & Portugal and a great demeanour. This is important because the tour manager not only interacts with the drivers and private guides but they also manage the group itself. They make sure everybody is on time. They ensure that tours start and finish as scheduled and they are at hand when language skills might be an issue – for example – recommending what dishes and drinks to try and communicating any medical or dietary requirements such as being vegetarian or vegan. In addition to handling all the logistics, the tour director will also provide briefing information on the itinerary especially for destinations where the group has ‘free time’. And the tour director is the person you can approach 24×7 while the tour is in progress – especially for any emergencies. 16 How do our clients remember who is meeting them/collecting them and where? Don’t worry. Everybody who travels with Totally Spain receives a detailed documentation pack, with a day-by-day itinerary with all the names and contact details for each guide and driver so they can be easily contacted if necessary. This information is provided weeks in advance of the trip and is especially handy if a client is running late. With Totally Spain, when you travel privately, you travel smoothly from start to finish. PLEASE NOTE that we will only schedule our expert private drivers and guides for travellers booked on a Totally Spain custom trip. If you are travelling independently, we will not be able to help you find drivers or guides. Posted in Getting Around, Insider Spain Guides, Popular Posts, Portugal, The Travel Industry, Useful Information and tagged chauffeur, driver, expert guide, food tours, guided tours, local guide, tour director, tour guide, tour manager, transfer, walking tours.